On the 12th May 2013 by kind invitation Langley School has invited Mark Jeffries to display his Extra 330SC at 15:30. The display was original slated for the March “daffodil day” however was postponed due to the extreme weather resulting in flooded grounds and no daffodils. 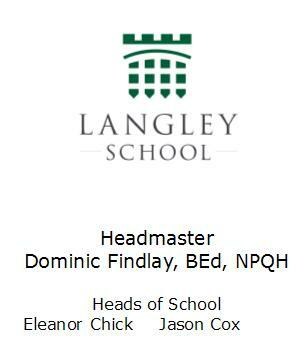 Langley School exists to provide a first-class, all round education within a inclusive, friendly and supportive community. Focusing relentlessly on improving standards our students will learn to be valued, independent citizens and develop their potential fully. Entry Cost: Adults £5 Concessions £3 Family ticket for 4 £10 New for 2013! Wristbands will be available at £10 for children to allow them to access all attractions throughout the event at no additional cost (not including refreshments). Attractions and Entertainment: Postponed from March due to particularly inclement weather, Langley School’s Daffodil Craft and Country Fayre is all set for its new date and promises to be a fun filled day for all. This year, visitors will have to keep one eye on the sky as the awe-inspiring International Air Display Pilot, Mark Jefferies, will be swooping in over Langley Park “air space” for a visit. If watching his spins and tumbles is too much for your heart (or stomach! ), never fear, as there’s lots going on to keep you busy. As you walk in the main gate, you won’t be able to miss the fantastic display of classic cars and steam engines. Linger around the rings to watch dancing, displays of dog agility, the marching band, karate, chain saw sculpture, firemen in action or enter your canny canine in our dog show. By now, you may need to re-energise. Slake your thirst in the outdoor “tavern” or tea tent and feast from the BBQ or on tasty bites from the school kitchen (refreshments not included in entry) Don’t forget, also, to pick up something tempting from the large selection of craft and food stalls both inside and out. With the purchase of a £10 (per child) attractions wristband, your children can burn off their energy all day with unlimited access to our great additional attractions: Segways, Quad bikes, Water Zorbers, Climbing Wall, Langley School Miniature Railway, Fairyland Trust Wand Workshops (limited to 25 children, age 3 and up, plus one accompanying adult per child per workshop at 12pm, 1pm, 2pm and 3pm), Fun Bikes, Trampolines and Bouncy Castles. (Age/height/weight restrictions may apply on motorised attractions, at the discretion of the attraction provider. Please check before queuing.) In the afternoon, follow the Fairyland Trust’s Rainbow Trail to seek out the Fairy Queen, who will be bringing a little bit of the magic of nature to Langley’s woodland and daffodil walk. Leave a message on the message tree for the fairy folk or take part in a choosing ceremony to determine the right native tree for your wand in one of four Wand workshops. In this tranquil part of the school grounds, the church nestles amongst the trees. Why not take a moment to go inside. Student’s artwork will be on display there all day. It is also interesting to see the restoration work that is helping to preserve this lovely old building. Tickets are available at the gate, but pre-booking is advisable if your child would like to attend a Fairy Wand workshop. In order to secure a place, you need to purchase, in advance, an attraction wristband costing £10 per child and make a formal booking with Jenny Rackham at the Langley School reception: 01508 520210. Cheques payable to Langley PTA please.